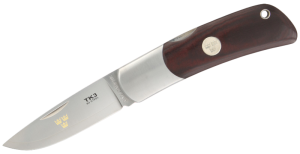 This is another excellent and highly prized knife from the Tre Kronor series with a handle made of Maroon Micarta that adds excellence and quality to the knife’s appearance and performance. With the new edge steel developed by Fallkniven and which is the 3G steel, this knife is surely amongst the front runners as far as performance and reliability are concerned. The steel comes with a core of Super Gold Powder Steel (or SGPS) flanked by two layers of VG2 steel which are anticorrosive and extremely strong in their own right. This gives steel which is surely the best in the business when it comes to the manufacture of knives for everyday and heavy duty use. The TK3mm’s design is a beautiful one and also ensures that it is quite enduring in every department. As with other knives in the Tre Kronor series, the TK3mm is the result of a painstaking design concept which focuses on the functions of the folding knife. The TK3 blade is a solid and practically unbreakable object which does represent the best value on the market today. With each folding knife manufactured by hand, you may expect small variations from time to time as no single model is the same. 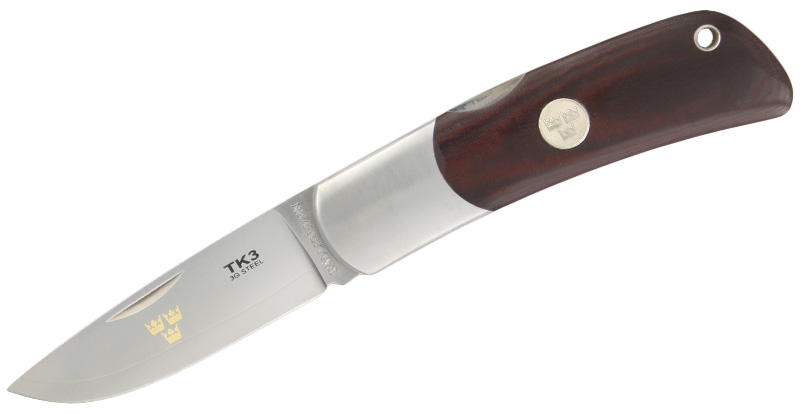 However the real winner as regards the TK3mm is the handle which is made from Maroon Micarta. This is a rather striking material which is used on most good quality and handmade knives. You can also apply a thin coating of oil to further enhance its lustre. The material is also ideal for gripping and provides various options in different situations where grip is essential. Although the TK3mm is intended to be used for everyday use, it can also handle much larger and more heavy duty tasks although for that, Fallkniven’s other survival or forest knives would be a better bet.